At Holy Trinity Lutheran Church Preschool, our grace oriented theology helps kids understand that they are beloved children of God and servants of the Living Christ in the world. Our comprehensive early childhood curriculum is research based and focused on multiple areas including Literacy Development, Mathematical/Logical, Creative Arts, Kinesthetic/Gross Motor skills, Musical, Emotional/Social development, and Scientific Explorations. Find our more about us. Enrollment Forms, Options, and Fees. Accepting ages 18 months to 6 years old. 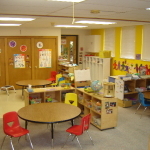 Children will explore a variety of centers during the course of their day. Teachers design centers intentionally to focus in a developmental skill. While a child plays and explores their world, the branching in the brain bursts. During centers, classroom teachers work with small groups of children and work one-on-one with children. Centers provide individualized instruction as well as student choice.